Hotel Genzianella Florence is a simple yet elegant 2 star hotel decorated and furnished in a modern style with rich colours and quality furnishings that is great value for money. Located in an excellent spot, Hotel Genzianella, Florence is a modern yet affordable city-centre 2-star hotel only 15 minutes walk from the Duomo (Florence's Cathedral) and also within easy reach of the Santa Maria Novella train station. This 2 star hotel is excellent value for money with clean and comfortable facilities and strong focus on customer service. Our highly trained multi-lingual staff are available 24 hours per day on the hotel reception to ensure that your every need is catered for. They can make restaurant or theatre reservations on your behalf, or arrange guided tours and other ticket purchases for you. There is also a fax and photocopying service and private parking is also available at a nearby location. Hotel Genzianella is located in the northern part of Florence’s city centre and is ideally placed only a short 15 minute drive from Florence’s main airport. 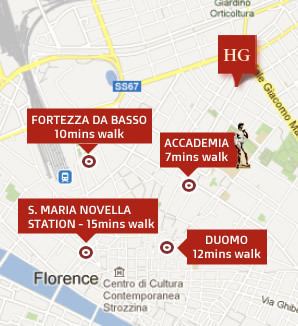 The city’s horticultural gardens and the San Marco Museum are literally only around a 10 minute walk away and the famous Florence Cathedral is only a brisk 15 minutes journey by foot.. Furthermore, the area has an ample choice of restaurants and bars for you to sit back and relax after soaking up the culture of Florence and the hotel itself is also a perfect place to retreat from the bustling crowds to reflect on what we’re sure will be a wonderful Italian experience.